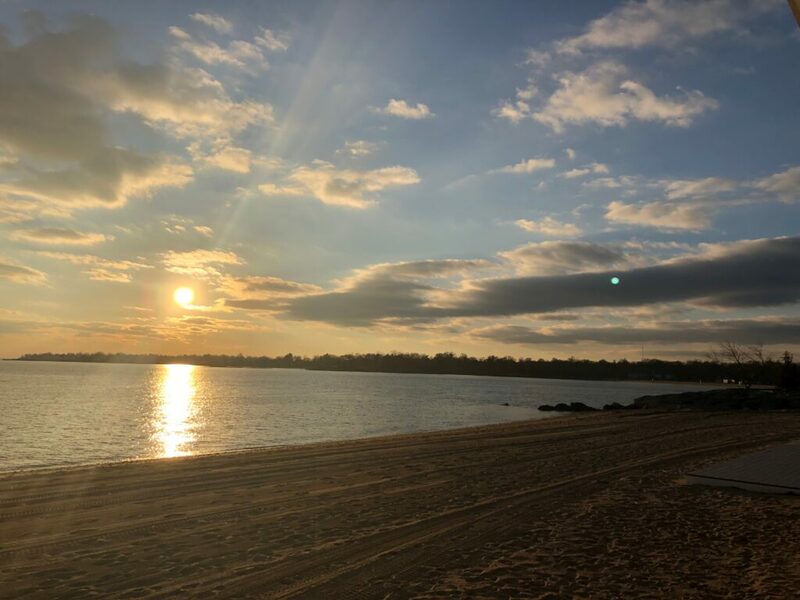 Over spring break, I decided to trek to one the the beaches in my hometown of Darien, CT, along the coast of Long Island Sound. I ventured out just as the sun had begun to set, and walked around up and down the shoreline for a while. I saw some seagull tracks, which I found interesting as March seemed a bit early for the seagulls to be coming back up north. 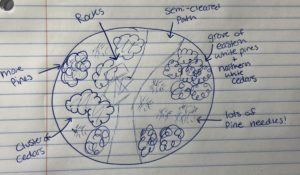 In terms of weather, it was definitely more windy, and as for tree species, it differed greatly from the hardwood trees of Burlington: the beach was mostly grasses closest to the sand, and small bushes on the outside of it, on the edge of the natural community. 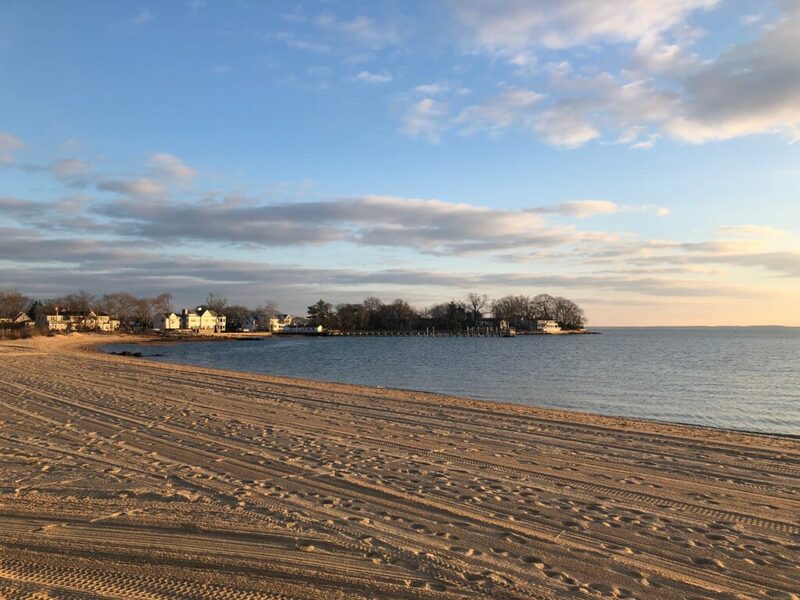 Long Island Sound and most of the CT shoreline has been industrialized, however, certain areas have been preserved as wetland communities and for recreation. Industrialization along the water has contributed to a large pollution and water quality problem in the sound, which many people are still working on solving today. This site is definitely very close to a lot of development on Redstone campus, so it is hard to say which natural community it fits best in. However, based on the placement of the area on a hill, with a lot of exposed rock within the soil, the landscape position indicates that this area might also be exposed to wind. 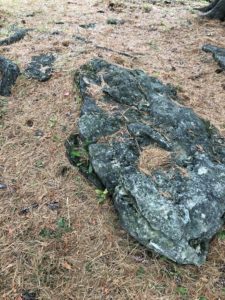 The thinner soil layer has the ability to grow eastern white pines, which dominate the small grove, and contribute to the acidity of the soil. However, with the species and soil present, I think this area falls into the Northern Hardwood forest category. 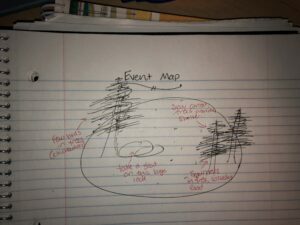 The eastern white pine, and the animal species such as squirrels and chipmunks that frequent the area, along with the other trees that occupy surrounding areas, indicate that this small community falls into that larger category, from Wetland, Woodland, Wildland. 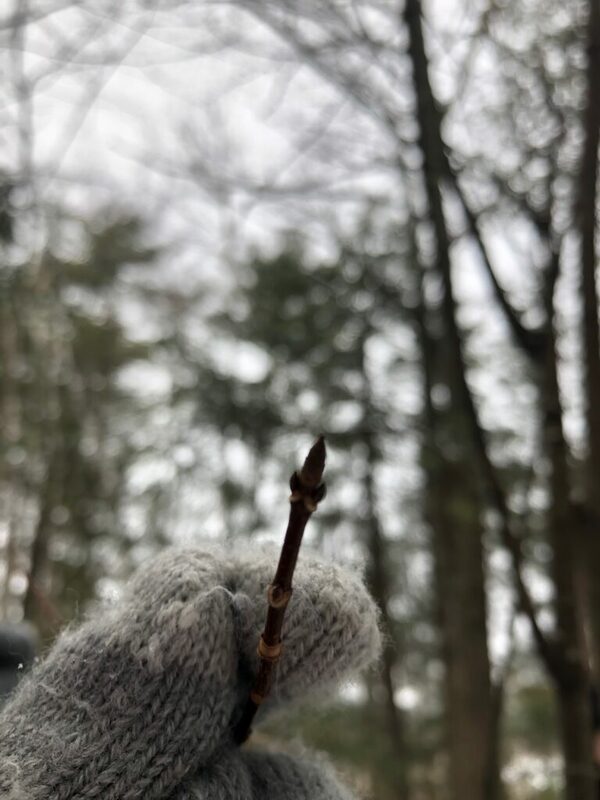 One of the twigs found along the path to my site. 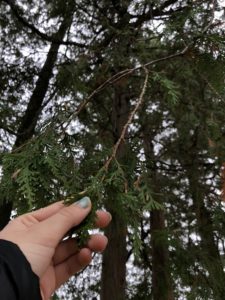 I would guess, due to the shape of the bud and the size, this is a maple twig, which is interesting considering there are no maple trees at my site. My guess is that it was carried over by the wind, weather, or some animal. 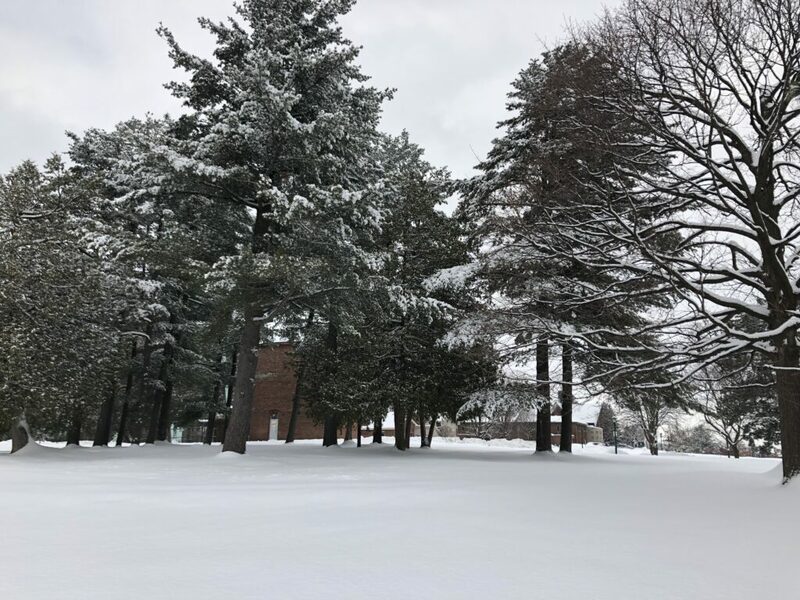 The trees that dominate this site are northern white cedars and eastern white pines, and many of the needles probably lie deep underneath the snow cover. While the fresh coat of snow was so pretty, it meant I couldn’t find many animal tracks in my area! In the past, I have seen small mammals such as squirrels frequent the area, using the trees as a habitat. In terms of phenological change of my site, the deciduous trees surrounding have lost their leaves, and the birds and mammals that had once frequented the area are nowhere to be found: hopefully going back after the snow has set in, will reveal some animal activity. 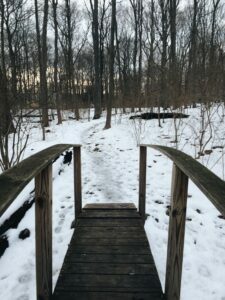 As the first semester concludes and finals week approaches, I find myself thinking about the relaxing qualities that first drew me to my phenology spot, months ago. I thought more about the origins of my place, and how it came to exist. 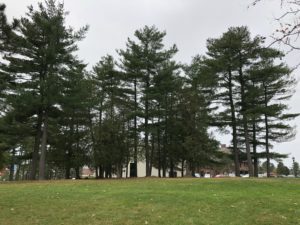 Eastern white pines tend to grow in areas of acidic soils that are not typically old growth forests, and given the proximity to dorm buildings and Redstone campus, the pine trees could have been panted in the area after a large construction initiative. How humans choose to use it today is up for debate, but I am grateful of the little oasis it has provided me with during a turbulent first semester. In the upcoming year, I plan to revisit my space and view how the seasons develop around the pines, and who else will frequent the area. The soft fluff of the late autumn snow coats the earth’s cold floor, carefully navigating the aged landscape of trees and fallen logs as if the emerging flakes can sense the direction of the ground below them. Beneath the blanket lies what remains from the beautiful, vibrant colors that define autumn’s arrival; the fiery reds and oranges are seen transformed to the rich brown leaves, protecting the life beneath them that has begun its dormant season. A dog prances through, rippling and breaking the texture of the gentle blanket. Periodically lowering his cool snout to the ground, he picks up loose flakes from the soft snow piles, and the scent of another creature, still preparing for the long sleep that winter so often inevitably brings. The woods are still as flakes continue to grace the maze of dormancy, the stillness of the moment unparalleled. A stillness, fragile enough to be interrupted only by the crunching of the dog’s paws and the small mouse he follows, through the kaleidoscope of brown and white. Tree branches sway and shake as a breeze flows in between the layers and patchwork of wood, following down to the trunks that define the space, and back to the layers of soft snow that dominates the land. The stillness of the small Connecticut woodland is echoed by its larger counterpart, the taller, boreal forests of northern Vermont. the large pine grove evokes a similar sense of oasis, from a bright, bustling life not far outside of its borders. The same sun that shines through the intricate pine needles of the eastern white pine grove up north, is the same light reflected in the frozen branches of the southern oaks. 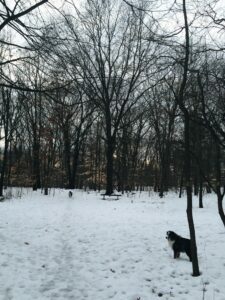 the creatures and life that dwell between the trees vary; squirrels and birds of different species frequent both areas, the Connecticut woods being more forgiving of a climate in contrast to the frigid northern Vermont temperatures. 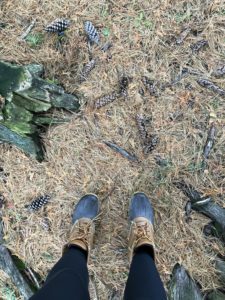 However, the grandness of the northern pines pales in comparison to the familiarity and comfort that is brought by being emerged in the woods by my Connecticut home. With my dog by my side through the early winter snow, a trek through this landscape is a true homecoming, although bittersweet as the last time I was home, these same woods were filled with the vibrant greens of late summer, only for me to return to find all the green has gone away, void of the life that had thrived before. 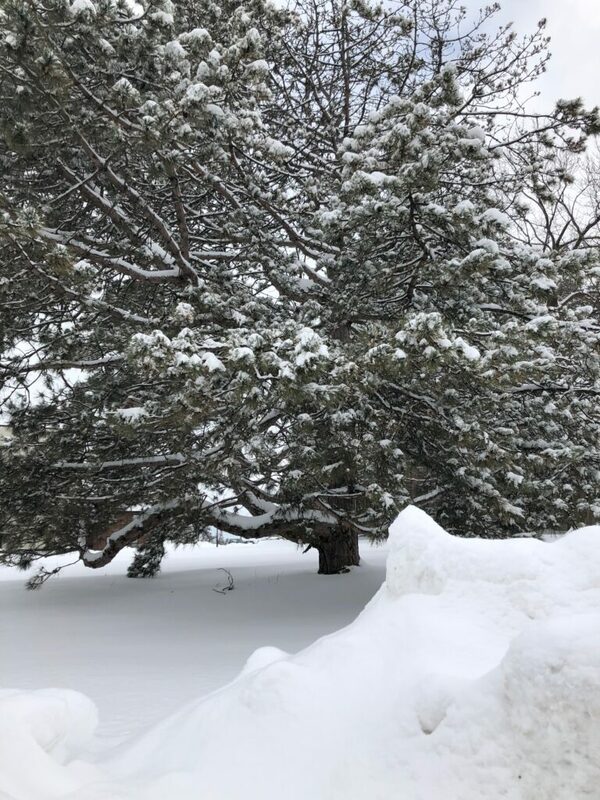 Found in my new home of Vermont, however, are the classic evergreens that prove that life continues, even in the most dreary and cold of days. My phenology spot is located just next to Converse and Redstone halls. 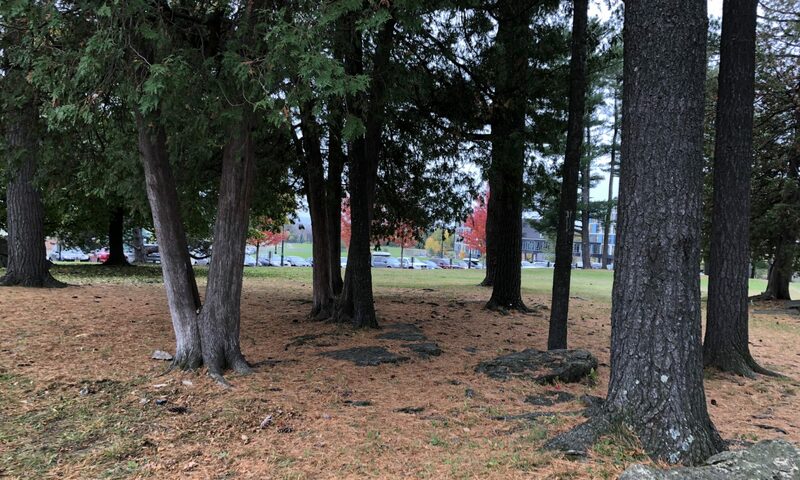 It is a grove of pine and cedar trees clustered together with a rock in the middle. I first visited the grove during my first week at UVM, and saw a few students sitting in the grass, studying, and enjoying the warm weather under the towering trees I was curious about the spot and how it would change along with the seasons, not only in an ecological sense but how the grove is used by students. 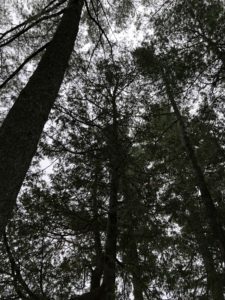 The beautiful eastern white pines and northern white cedars that tower over the land evoke a sense of smallness, yet serenity, that can be viewed when present in the space. Getting to the grove is very easy, as it is just a short walk from either Redstone or athletic campus. From Redstone, walk towards athletic campus on the road, past Coolidge and Redstone halls and the spot should be on the left across the street. 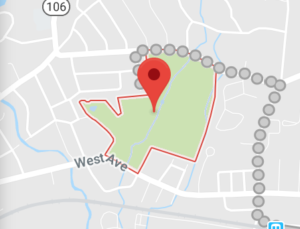 From athletic, head along the path between uheights north and south, and follow the bike path, past the Catholic church and the pines will be straight ahead before the road. Coming from central campus, cross the street at the bus stop or take the tunnel through the Davis center. 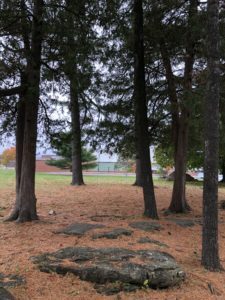 Walk along the bike path with the yellow catamount tracks and head up towards Redstone hall, and the pine grove should be on your right. 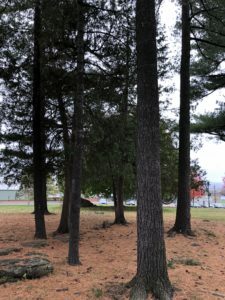 The small area is dominated by northern white cedars and eastern white pines, with some small grassy plants growing around the rocks and at the base of the trees.